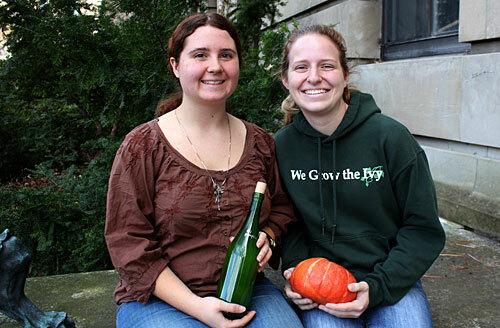 As an independent study project, viticulture and enology majors Melissa Aellen and Gillian Trimber are turning pumpkins into wine. 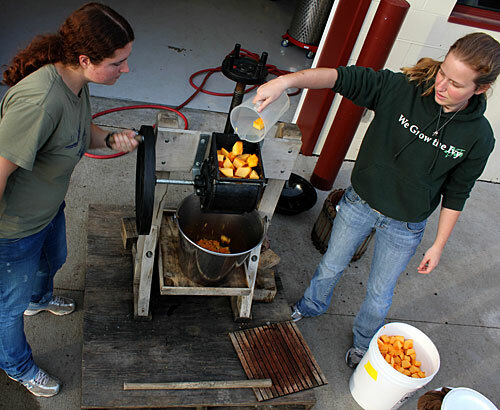 They peeled, chopped and milled cooking pumpkins at the teaching winery at Cornell Orchards. Then they mixed the pumpkin with enzymes to break down starch and pectin, and added sugar and water. 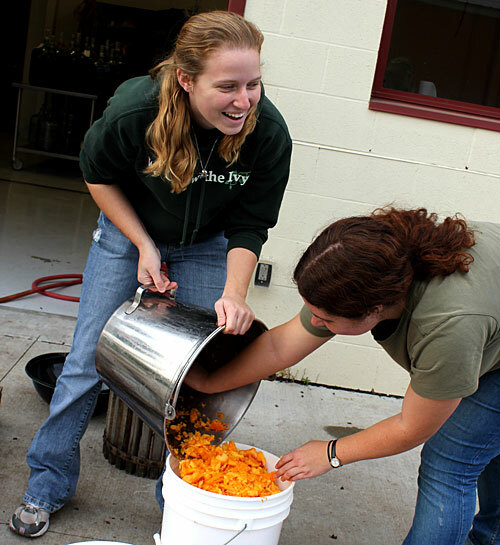 “We’re planning to add different levels of sugar after fermentation to see what tastes best,” says Melissa, who got the idea for making pumpkin wine while working at a Midwest winery last summer. After fermenting for about three weeks, they’ll bottle the results. “If this works out, we plan to fine-tune our recipe next fall, and try adding spices before we bottle it,” says Gillian. Read more about the viticulture and enology major. Gillian and Melissa mill pumpkings to make wine. They'll mix the milled pumpkin with water and sugar before fermenting. So how did the wine turn out? “It didn’t get rave reviews,” said Melissa. “We got comments that there were hints of over-ripe flowers, spoiled milk and mold. Our main problem was that we only got a little bit of the pumpkin flavor. Gillian Trimber and Melissa Aellen with the fruit of their labor. In How Long Does a Pumpkin Last? (The Salt, NPR’s food blog, Oct. 24), Steve Reiners offers tips for how to make your pumpkin — carved or not — last longer. Researchers get grants to sweeten New York apple crop (Cornell Chronicle, Oct. 26) reports on an $80,000 NYS Department of Agriculture and Markets grant that will enable Terence Robinson (right) to apply weather data to predict the apple trees’ carbohydrate supplies and demand status, factors that affect their receptiveness to chemical thinning. “If this project can help even half of New York’s apple growers achieve optimum fruit size on 25,000 acres of apples, it will have a potential economic impact of $100,000 to $175,000 annually,” Robinson said. To Combat Climate Change, Prof. Wolfe Looks to Soil Health (Cornell Daily Sun, October 17) profiles David Wolfe. Custodians debut green building care program at Cornell’s New York State Agricultural Experiment Station in Geneva (Station News, Oct. 6). After a month of testing, and the system is both environmentally friendly and safer for human health. 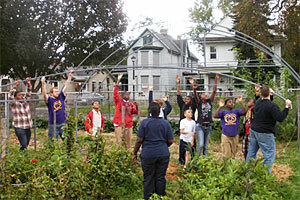 High tunnels engage students and extend the school gardening season. From New York schoolchildren use high tunnels to grow veggies by Elisabeth Rosen, Cornell Chronicle, October 26, 2011. “‘We will be checking with the teachers on how they use the structure to teach other subjects, such as the concept of global warming,’ Wien said. “All schools in New York state with gardening programs were invited to apply for the program. Those selected were chosen based on their level of interest, according to Wien. The next school to receive a tunnel will be PS 205 in Bayside, Queens. The other three schools have not yet been determined. View WROC News 8 Rochester video. 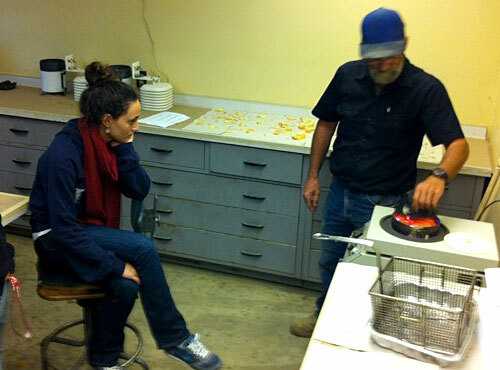 Top to bottom, potato grading line, Don Halseth reveals potato flaws, and analyzing chips. From Frank Rossi, who introduces students to plants grown for foods, beverages, fiber, aesthetics and recreation in HORT 1101 (Horticultural Science and Systems). View more HORT 1101 posts. This week, our HORT 1101 students visited the Homer C. Thompson Vegetable Research Farm in Freeville, N.Y. Farm manager Steve McKay gave us a short overview on the challenges of managing research for faculty in seven departments on more than 55 acres. Later, we hung out in a high tunnel growing organic broccoli and discussed the unique issues of growing and marketing crops in tunnels. 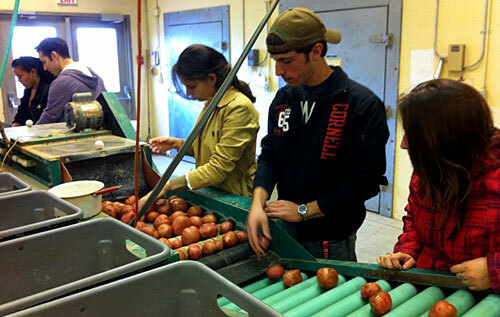 Our lab experience focused on potato grading. Don Halseth, our potato guru in the Department of Horticulture, and his team of Jeff Kelly, Randy MacLaury and Eric Sansted led the students through the grading process. That’s where potatoes are counted, washed, defects removed, and sorted by size. The stduents helped the team process several potato varieties that are part of Professor Halseth’s potato evaluation program that he coordinates for breeders around the country. After we graded the potatoes, we had a short demonstration of how to measure specific gravity to determine percent dry matter. Then it was on to the chipping evaluation. With about 75 percent of all potatoes in the U.S. grown for processing, understanding the quality of the potato when chipped is criitical. Randy led us through the standard methodology used to create the chips, and then measured light emission through the chips. The higher the sugar content, the browner and less uniform the chip emerges, and this is less desirable to the potato chip makers. Then we found a salt shaker and ate the fruits of our labor! Yum. Nothing like a freshly made, lightly salted potato chip. My favorite was the purple ones! Acta Horticulturae 903 was published in August. This was the proceedings from the 9th International meeting in Geneva in 2008 of the joint International Society for Horticultural Sciences working group meeting of Orchard Systems, Rootstocks and Environmental Physiology of Fruits. The meeting convenor and Acta Editor was Terence Robinson (right) with help from several other Cornell and ARS fruit faculty. The meeting, with many paper sessions and field trips in western New York was the largest in the history of the group with over 270 participants giving what is believed to be the largest Acta ever with about 175 papers and 1225 pages. A news release from Sen. Charles Schumer‘s office. Reports in the Wine Enthusiast magazine, Wines and Vines and The Wine Press from the New York Wine and Grape Foundation. An article in the Western Farm Press. The original Chronicle article was also widely distributed through news services such as MediaNewswire. The projects, headed up by Bruce Reisch and Tim Martinson, are funded by the USDA’s National Institute of Food and Agriculture (NIFA), as part of its Specialty Crop Research Initiative (SCRI) program. If you missed Mark Mazzola’s seminar Monday on ‘Biofumigation’: It may be more about biology than fumigation, you can view it below. In a memo today, Dean Kathryn Boor announced this year’s CALS Research and Extension and the Core Value Staff awards. Among the winners, Bruce Reisch (right). 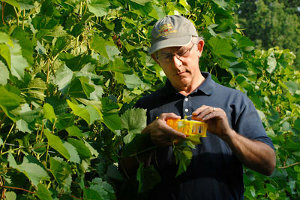 Bruce will receive the Award for Outstanding Accomplishments in Applied Research for his many contributions developing transformation technologies for grapevines, applying molecular markers to disease-resistant breeding, and breeding new grape varieties that have had a significant impact on the wine industry. The awards will be presented during a 4-6 p.m. reception on Monday, November 7, in G10 Biotech, with remarks scheduled to begin at 4:45 p.m. Hors d’oeuvres and beverages will be provided. De-stress on Mann Library’s lobby lawn. 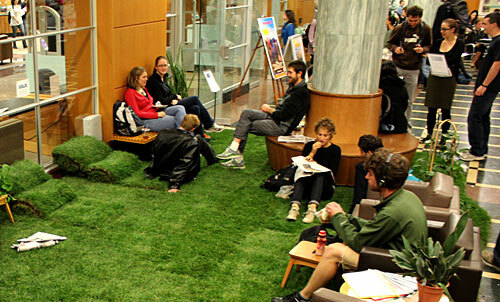 A little lawn in the Mann Library lobby. With advice from turf specialist Frank Rossi, Gilad Meron (DEA ’12) installed a little lawn in the northeast corner of Mann Library‘s lobby. Yes, you can sit, lay down and roll around on the grass, but please don’t stomp on it. The grass is part of the exhibit. Various professors in Human Ecology have done research on the restorative benefits of nature. Instead of telling you about this, we decided to show you. So sit, relax, lay down, and enjoy the grass! Rossi says the grass should last a week or two, depending on traffic. Additional exhibits in the library lobby chronicle the paths that College of Human Ecology faculty and students have forged over the past century, highlighting the people and principles that have helped make the College a world leader in research, teaching and science-based extension.